This is the best ever chicken fajita crockpot recipe. It’s so easy to make and you can choose how long to cook it and what to ingredients to use. It’s no secret around here that I love my crock pot. 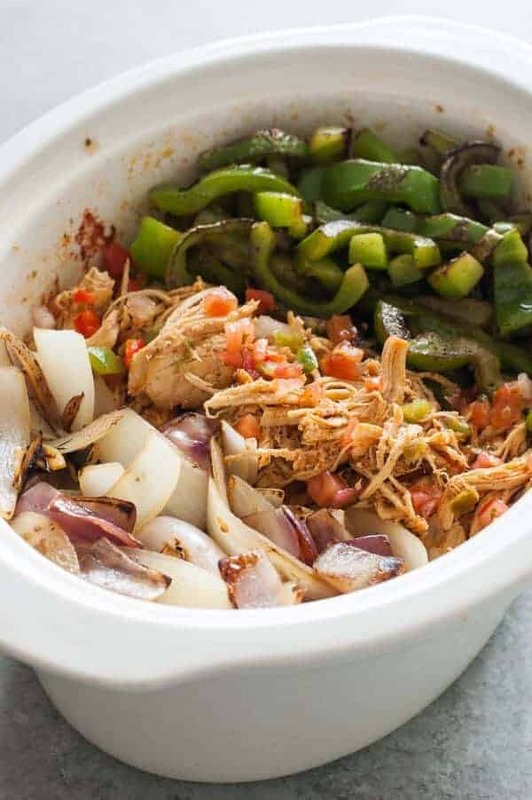 I mean, it seems like everything in the crockpot is easy, tender and delicious, especially this chicken fajita crockpot recipe. The chicken gets really tender from cooking. You can choose if you want to cook the chicken for 4-5 hours on high or about 8 hours on low, depending on how it fits into your schedule. Usually, I don’t like to cook chicken breasts in the crock pot because they get dried out, so that’s what makes adding the pica de gallo in with the chicken so good. It not only gives the fajitas good flavor, but it also helps to tenderize them and helps keep them from drying out – oh, and so easy to just dump something already made in your crockpot (or you could make your own). 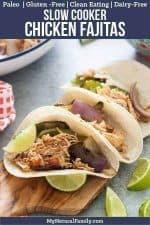 This chicken fajita crockpot recipe is also really good for groups because people can pick and choose the ingredients they like and get their own and you can keep the meat warm and have it made ahead of time so you can focus on last minute preparations for your party. It is also good that way for different diets because people can pick and choose which ingredients are good on their particular diet. As for the vegetables, I didn’t add the vegetables to the crockpot – just sautéed them on high heat and put them with the chicken before serving so that they stayed crisp, but browned. This makes for a more traditional fajitas flavor like they have at restaurants. Alternately, you could add the veggies to the crock pot for the last hour or two if you wanted. They would not be the same but would be easier since you wouldn’t have to cook the veggies at the last minute. Sometimes I roast the vegetables in the oven. Just cut them up and put them in a single layer on a pan, drizzle with oil and salt and cook on 425. I personally love these with tomatillo salsa. For the Paleo diet, I often substitute the sour cream with my homemade mayonnaise without anything added to it, so just eggs, salt, vinegar, and oil. I generally prefer the red, orange and yellow mini pepper medley instead of green peppers and I love sweet onions instead of the red and yellow onions. Instead of cooking this on high for 4-5 hours, you can cook it on low for about 8 hours. Just check the chicken every once in a while though, because chicken breasts dry out very easily. Luckily, the salsa cooked with the chicken helps that a lot. Please let me know if you try this recipe. I would love to know what you like about it. Do you make fajitas at home very often? Personally, I love these with tomatillo salsa and avocado and I would love to hear your favorite way of eating them. Cooking the chicken in the crock pot with the salsa makes the meat really tender and flavorful. Place the chicken breasts in a crock pot. Top with the cumin, paprika, chili powder, salt, lime juice, diced green chilis, and salsa. Cover and cook on high for 4-5 hours, or until chicken is tender and shreds easily. Shred the chicken lightly and replace the cover. Heat the oil on high heat in a large saute pan. Add the peppers and onions to the pan and saute until browned in places, yet still crisp. Your pan will need to be very hot to do this. Add the cooked vegetables to the crock pot with the chicken. Serve with tortillas, sour cream (optional), salsa, and lime wedges. Omit the tortillas and sour cream for Whole30. For Paleo use tortilla recipe above. Omit the tortillas for Gluten-Free. I hope you love this chicken fajita crockpot recipe. I am making this for a family which does not like spicy foods. Can I omit the canned chilis? Thank you for including a link to your Paleo tortilla recipe. This looks really good, I am going to try it soon. 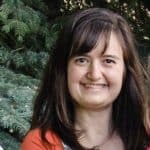 Thank you for so many good Paleo recipes. I love to come to your blog and look for new recipes. The crock pot chicken fajita recipe looks great! I’m going to make it this week. Just out of curiousity though, the recipe calls for serving on a tortilla and with sour cream as an option – grains and dairy. How are these part of the Whole 30 diet? Leave those out for Whole30. I thought I had put a note about that, but hadn’t, so thanks for the reminder. Thank you for sharing this recipe. I used my crockpot and cooked on high for 4 hours. It was absolutely delicious! My family enjoyed it and we have leftovers for tonight. ?? I’m so glad you liked it! Yes, the chicken leftovers are very versatile and can be used for lots of different things. Thanks for this recipe! I’d like to make it in my Instant Pot (pressure cooker) instead of my slow cooker. Can you please tell me how long you’d cook this recipe and on which settings in the Instant Pot? Thank you! When I cook plain chicken, I put it in and push the chicken button, which does it for 15 minutes. But usually when I add other stuff like this and it’s fuller, I push the soup button just to make sure it’s all cooked. It depends a lot on how big your pieces of meat are. If you have smaller chicken breasts or tenderloins then I may put it in and push chicken and then push the plus button up to about 20 minutes. Can you tell I just kind of eye ball it? I have never actually overcooked something in it to the point that it was dry, which is one of the things I love about the Instant Pot. I’ve dried out chicken breasts in the crock pot plenty of times.